For over three decades, the San Diego California trucking injury lawyers at DiMarco | Araujo | Montevideo have helped clients get the medical attention they deserve and receive the maximum legal compensation after truck accident injuries. As you could unfortunately already know, trucking accidents have the potential to be even more catastrophic than other accidents due to the large size and fast speed of trucks. Another factor that can multiply the accident’s sad result is the heavy loads they carry and how that makes it harder to stop and easier to jackknife. During our successful careers, we have represented the entire scope of injuries for trucking accidents including burn injuries and head injuries to amputation and broken bones. We promise to work hard every day to remain the best San Diego trucking accident injury lawyers. Our quality and ethical reputation throughout San Diego County speaks for itself: We are experienced and successful truck accident attorneys who work tirelessly to protect the rights of their clients and help them recover both financially and medically. Options, strategies and advice for how you could be able to do-it-yourself. Potential litigation issues including: expert witness depositions, law and motion, written discovery, types of causes of action, lay witness depositions, investigation, pleadings, legal evidentiary standards of proof and legal requirements, potential special and general damages including: loss of earnings, medical treatment, bodily injury, temporary disability benefits, and other damages and benefits you are entitled to recover. How we could make your case simple, efficient and successful. Our San Diego County truck accident attorneys are prepared to use their experience and knowledge to take the load and stress of a lawsuit off of your shoulders. We have been doing this since the late 1970s so you should feel better knowing you will be in good hands. If after meeting with us and discussing the numerous important steps and costs that are needed to file, litigate, investigate, negotiate, and potentially take your trucking injury case to trial, please know that we will always be here for you. We sure hope this website helps you to learn more about injury law and that you get to your maximum medical improvement in a timely manner. Serious accidents are major life events and the outcome of your legal trial will impact your life forever. You deserve the best lawyers in San Diego who have the staff, ability, experience, knowhow, and training to get you the maximum compensation you can get under the law. The Better Business Bureau has constantly awarded us their highest rating of an A+. 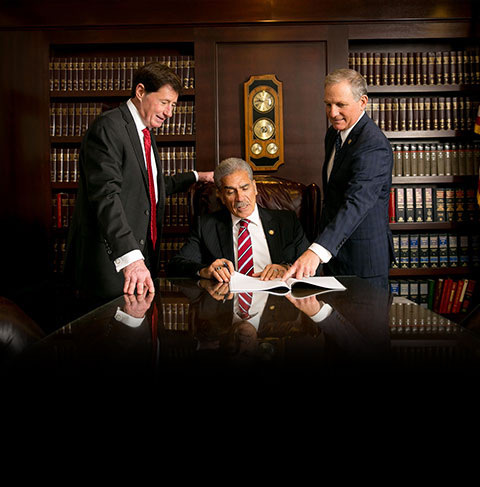 You will be able to have the peace of mind that we will work diligently throughout your case on your behalf. We are ready to start your trucking and hauling work injury, workers’ compensation, and personal injury case right away so call our firm at (619) 946-6466. We will conduct a case evaluation to look into the merits of your case and be able to discuss your legal options. The initial consultation and meeting is free and we’ll work for you and your family on a contingency basis after that where you won’t have to pay our firm even a cent unless we win your case. One of your concerns should be to not get victimized again by not being awarded all the monetary compensation you deserve. Most of the potential results of truck accidents can be very traumatic. Contusions, back injury, ligament sprains, blindness, burns, concussions, broken bones, brain injury, muscle strains, heavy bleeding, coma, being crushed, neck injury, amputation, becoming deformed, whiplash, cuts, lacerations, and death are all potential outcomes of trucking accidents. The truck accident injury attorneys of DiMarco | Araujo | Montevideo have over three decades of experience assisting truckers or those hit by a truck with their legal injury cases for all the above injuries and many more. We will stand by your side throughout the legal process. If you don’t have a doctor or medical plan for your truck highway accident, truck load shift accident, truck unloading accident, truck loading accident, or truck road accident, we can help find a local one that will be able to give you the comprehensive and timely treatment that you deserve by law. It is the law in this state to make sure that all employees (including truckers) are covered by workers’ compensation insurance. It should provide assistance when an employee gets hurt on the job. Workers’ compensation laws also protect the rights of the injured employee. This is important as you most likely already know the history of how injured employees used to be treated. One of the protections is that employers cannot penalize or fire employees for filing a workers’ compensation claim. As with any insurance, workers’ comp insurance does have limits. It also does not allow for monetary damages for pain and suffering and other damages allowed by personal injury law. The work comp insurance held by your employer might provide money to you and your family for medical benefits, disability, income, medical expenses, death benefits, permanent disability compensation, and vocational rehabilitation, when the injury, accident or circumstances warrants such payments. See the information below regarding “adding third parties who are also at fault” for trucking accidents for more info on maximizing your compensation and benefits. You should probably schedule your free initial consultation soon so that you can talk about your job injury with our experienced San Diego County workman comp attorneys. As you can predict, it is important for you to make decisions about your case only when having up-to-date and prudent advice from seasoned truck accident lawyers like ourselves. We will answer all of your questions including if you are wondering just how SDI (State Disability Insurance) works, what the workmen comp benefits may end up being specifically for you and your family, and how much a work compensation attorney costs or how much a work injury lawyer costs? Regarding that question, you will not have to pay our firm anything unless we win your trucking accident case. If you lose the case then you will not be out any money for our time and service. In addition, we will make sure you feel confident and up-to-date throughout the case as our firm strongly believes in educating our clients. For trucking accidents, third parties could be people, contractors, companies, manufacturers, factories, traffic engineers, repair shops, road designers, part suppliers or government entities that are also responsible for part of your trucker workplace injury other than just your employer. By adding the third party, you might be able to receive compensation and benefits beyond that which is provided by the workers’ comp set of laws for this state. If you are filing a workers’ compensation case but you hope to recoup your complete lost income and damages for pain and suffering, our injury investigators will need to prove that a third party like that of a road or highway construction firm, truck mechanic, truck manufacturer, part manufacturer, an entity listed above or others has a share in causing the trucking accident. If you feel your work comp case may have a third party also at fault, it is even more important for you to call one of our local San Diego workers’ comp accident attorneys today at (619) 946-6466 to discuss your injury, your case circumstances and your legal options. These cases need to be coordinated from the beginning and handled correctly since there could be two or more cases for the one truck accident injury. Our experienced truck accident injury lawyers and staff have handled cases just like these since 1979 and, if your case has merit, we will be able to handle your set of cases. The Occupational Safety and Health Administration (osha.gov) is in existence to set laws, standards and regulations that help keep all work environments in this country as safe and as healthful as possible. Their standards get higher every year and their influence reaches far and wide. This even includes the many working environments of truckers: the freeways, rest stops, warehouses, storage sheds, truck yards, sleeper cabs and their mobile workplace of the truck, 18-wheeler, tractor trailer, big rig, semi-truck, 16-wheeler, tanker, and all other types and brands of trucks. OSHA states that “Every day in this country, more than fourteen workers lose their lives in preventable workplace tragedies.” Because of that tragic statistic, OSHA continues to get even tighter on truck driving rules, road safety, freeway safety, and driving conditions so that hopefully less people get hurt or killed. OSHA actually even has a section of its laws that are devoted to the trucking industry in general. OSHA investigates injuries, accidents, equipment and safety code violations by interviewing witnesses and employees, looking at the black box records when available, checking driving logs, reviewing maintenance records, conducting site inspections, and by conducting other investigations. They also make sure to keep the identities of all truckers or employees who contact their hotline regarding unsafe working conditions, unsafe work hours, defective parts, OSHA violations, and potential truck accident risks anonymous, if the employee requests it. Truckers can be scheduled to drive for many hours on end throughout all times of the day and night and in the complete range of weather conditions from sunny and dry to cold and rainy. One of the main reasons truck accidents cause so many injuries and deaths each year is that trucks can even be 40 times heavier than the car, motorcycle, SUV, or van that it collides with on the road or in the parking lot. Over 70 percent of the victims of truck accidents were not actually in the truck. Trucking accidents can happen in many ways including illegal lane change, rollover, driver on drugs, improper loading, rear-ender, unsafe lane change, improperly secured load, spill, poor repair or maintenance of the truck, out of control downhill, an intoxicated driver (DUI), a drunk driver, overworked driver, negligent hiring, drugged driver, air-brake failure, illegal loads, blind spot accident, a car got hit while it was in the way of the wide turn, driver on his cell phone, another driver hit the truck, load too heavy, driver fell asleep at the wheel, run-off-road collision, and animal collision. It is important that the trucking company you work for always keeps up on the maintenance of your truck as that helps avoid some trucking accidents. Some more types of causes of trucking accidents that occur in San Diego include head-on collision, hit a pedestrian, collision with a median or barrier, collision with a pole or stop light, swerved into a car, hit a deer, side collision, swerved off road, under the influence driver, load shift, brake failure, speeding, jack brake failure, jack-knife, side swiped a car, poor road design, low building clearance, equipment failure, sleep deprivation, hit road debris, poor road condition, driver eating or calling, poor eyesight or poor reflexes, poor road construction, inexperienced U-Haul driver, low warehouse clearance, too much downhill speed, low bridge clearance, trucker texting, or a distracted trucker on a cell phone while driving. Trucking accident injuries can be serious and fatal so let us help you protect your rights and recover as much as possible. Each trucking company has years and years of experience as the defender in truck accident injury cases so they invariably have a department of defense attorneys ready to do whatever it takes to win the case and/or minimize or negate the compensation payout to the victim. As discussed elsewhere on this page, the trucking companies have the whole routine down as to how to immediately start building their case from the moment the accident happens. We know that you need our legal assistance to receive the maximum legal compensation for your truck accident injury. Trucking companies have been accused of many unethical maneuvers to give them the advantage. One example is that of tying up the legal process so that individuals representing themselves cannot sustain the cost of the legal effort. They have also been known to falsify their truckers’ driving logs, not enforce their trucker rules and regulations on their employees, falsify the truck maintenance records, and lose critical records like the receipts, black box, computer records, driving logs and more. When a truck is involved in any way in any type of accident, the trucker is sure to radio it to the company dispatcher. The dispatcher then contacts the trucking company’s team of defense lawyers so they can get to the trucking accident site possibly even within an hour of the tragic event. Sometimes they are there faster than the tow trucks, police, ambulance, or fire trucks. Their team immediately starts to prepare and build the case and they have been known to sometimes even destroy, modify, hide, or falsify the evidence. If the large company you will be up against in court is legally defending their case so quickly after the accident, shouldn’t you have a team of lawyers working your side of case soon as well? Call us as soon as you are able as we could help you preserve the important evidence and protect your side of the case. It is important that you are proactive when facing the above and that you hire some of the best San Diego truck accident attorneys around. We are ready to start investigating the accident and representing you. ¿Habla Español? Click “en Español” to translate the information about our San Diego truck and car accident lawyers to Spanish. Call us anytime today at (619) 946-6466 so that our Spanish speaking staff will be able to discuss your case and what your legal options are. Following any accident, it is always a good idea to remain as calm and focused as you can. It is true that all of the numerous little decisions that are made directly after a truck accident could affect your case, your health, your potential compensation and your recovery. Be sure to get a hold of some of your friends for help (after you call 911 and you secure the accident evidence). It is important to get immediate medical treatment as many accident injuries, such as neck injuries, whiplash injuries, some broken bones, and back injuries, do not have immediate pain or symptoms but they do need quick treatment and medical attention to allow you to recover as quickly as possible. Be sure to retain as much evidence as possible including being sure to take pictures with your own camera or cell phone, write down the info for all other parties involved including witnesses, write your own record of what happened, and protect your vehicle that was involved in the crash. Our trained staff will want to investigate the vehicle and all the evidence right away. The California state law is there to protect the rights of people that get injured due to the fault of another person, company, or corporation. The types of compensation that you might be entitled to could include payment for your medical bills, life-care, loss of current and future wages, punitive damages, property damage, pain and suffering, changes to your lifestyle, and more. We can discuss with you during the free consultation whether or not your case and circumstances warrant those compensations. We will also discuss what we feel is the potential monetary amount that could be coming to you if your case has merit and we win in court. All levels of government have laws that are designed to attempt to make trucking and driving all vehicles as safe as possible. For the trucking industry, the government has many size, weight, driver training, route, vision and design regulations and restrictions. In terms of whose rules truckers have to follow, it depends on where they are at the moment. When the truckers are driving on the National Network of US and state highways (that are considered interstate freeways), they come under federal regulations. When those same truckers are driving onto intrastate highways and freeways, they come under the state’s rules. To protect bridges and overpasses (and prevent possible tragic accidents), there is the Federal Bridge Gross Weight Formula. Weigh stations and CHP are also important ways that our government enforces its trucking regulations. In addition, the government continues to pass laws that require trucks, truck builders and trucking companies to add safety features, quality improvements, sensors, secondary safety features, and warning lights. Caltrans continues to manage more than fifty thousand miles of CA highways after being around for over one hundred years. They also work with local agencies to connect the boulevards, frontage roads, local streets, avenues, and roads to the highway’s bridges, tunnels, offramps, onramps, overpasses, and interchanges. Additional causes for motorcycle, SUV, car, and trucking accidents are poor road conditions, ineffective curve angles, defective road designs, bad downhill/uphill designs, a lack of a center divider or guard rails, bad parking lot or unloading dock layouts, and unmaintained roads and highways. Additionally, poor water flow and water drainage can cause puddles, loose gravel, slippery conditions, mist, sprays and other very unsafe conditions that are prone to causing accidents. Caltrans or local government agencies may be liable if it is proven that their traffic control devices are negligent or not properly designed or installed such as road paint, stop signs, reflectors, traffic lights, traffic signage, warning signage, and detours. We can help you investigate your truck accident to see if a government agency was partially at fault. Since a few of the biggest causes for truck accidents are overworked, sleepy, or exhausted truckers, the government regulates the amount of hours a truck driver can operate a truck within a certain period of time. A trucker is required to keep a log book or an electronic on-board recorder to keep track of their hours of driving, breaks, out-of-cab time, and duties. The current hours of service rules revolve around a max of 11 hours of driving in a 14 hour window which is then supposed to be followed by a 10 hour period of the truck driving resting. Truckers are also required to get a commercial driver’s license to be able to operate a truck within the US. There is more information regarding commercial licenses below. Governments should have direct oversight over the construction projects of all road and traffic projects including bridge, underpass, street, intersection, overpass, boulevard, offramp, onramp, and freeway projects. This oversight can create a duty and responsibility of the building, safety, permit and/or planning division of any municipalities, state and federal governments. Most agencies have a building and planning division that oversees commercial and residential construction projects. We have 30+ years of experience working with cases involving government entities and we will be sure to look at that part of your accident. The Federal Highway Administration (FHWA) has a full set of minimum standards that each state needs to meet or exceed for their state commercial license. Visit the DMV website to determine which commercial license you need out of the following: Class A, Class B and Class C. A specific one is needed when driving a vehicle with either the capacity to hold a certain number of passengers or a certain amount of load or cargo. Further tests and certifications are needed for drivers of school buses, tank trucks, and trucks with hazardous materials. In this age of more and more mobile technology, the Department of Transportation, the DMV and CalTrans are working hard to find ways to prevent trucking accidents and trucking injuries that are due to distracted drivers. Smoking, texting, eating, cell phones, drinking, using the in-car GPS or map routing device, and loud music all have contributed to truck accidents in the last year. California has some of the country’s biggest airports, farms, ports, manufacturers, refineries, factories, and stores that constantly need to ship their raw materials, supplies, products, produce, and merchandise all across the state and country. Some of the major truck routes in California where trucking accidents happen are: Interstate Highway 19 (I-19), Interstate Highway 805 (I-805), Interstate Highway 5 (I-5), Interstate Highway 14 (I-14), Interstate Highway 10 (I-10), Interstate Highway 60 (I-60), Interstate Highway 80 (I-80), Interstate Highway 8 (I-8), Interstate Highway 215 (I-215), Interstate Highway 405 (I-405), Interstate Highway 99 (I-99), Interstate Highway 15 (I-15), Interstate Highway 905 (I-905), Interstate Highway 395 (I-395), Interstate Highway 40 (I-40), and Interstate Highway 710 (I-710). Every year, many thousands of trucks, semi-trucks, big rigs, and tractor trailers use our freeways and streets to move goods throughout our state. Since 1979, our firm has helped thousands of clients who have suffered all types of work injuries and personal injuries. We are proud to say that a rather large number of those clients have been injured truckers who we’ve been able to help rebuild their lives through a positive settlement or trial verdict. The major types and brands of trucks and tractor trailers that are on the road today include Dodge truck, Ford truck, motorhome, Renault Magnum truck, big rig, Kenworth, platform truck, box truck, cab over, GMC truck, Penworth, 18 wheeler, open truck, semi-trailer, semi-truck, Peterbilt, Mack, flat bed, double trailer, refrigeration truck, live stock truck, Bobtail, construction trucks, cement truck, car/vehicle transport, tractor, tanker, tractor trailer, retail truck, ballast tractor, bottler truck, three axel truck, Pierce truck, dump trailers, enclosed truck, Colet, grocery truck, and cement mixer. More types of trucks and tractor trailers include Freightliner, Sterling, dump truck, Daimler truck, multi-stop truck, mobile crane truck, GINAF, Leyland, heavy hauler, log carrier, truck-mounted crane, fire truck, Isuzu truck, UD Nissan truck, Western Star, Chevrolet truck, MAN truck, recreational vehicle (RV), tow truck, Oshkosh, Crane Carrier Corporation, horse trailer, garbage truck, crane truck, pickup truck, DAF truck, Tata Motors, Hyundai truck, pic trailer, plant trailer, oil tanker, dog truck, Hino Truck, panel truck, and full-sized pickup trucks. All of these types and brands of trucks are useful for what they were designed to do but it is very important that you are always on alert for truck defects or product defects as they can cause truck accidents as well. We will be forthright with you throughout the legal journey. We are well known throughout San Diego, California, Orange County, Escondido, Los Angeles, Carlsbad, San Bernardino, Vista, Long Beach, El Cajon, Chula Vista, Riverside, Oceanside, San Marcos, Encinitas, National City and the San Francisco Bay Area as top trucking accident attorneys who know how to help injured people get the compensation they deserve. We offer a free initial consultation and case evaluation for all injured truckers and injured drivers. After the initial no-cost meeting, we will work for you on a contingency basis where you won’t have to pay us anything unless we win your accident case. The San Diego trucking injury lawyers at DiMarco | Araujo | Montevideo are willing to have the meeting at your home or hospital room if you are unable to come to our office. We are available to meet Monday through Friday between 8:30 AM and 5:30 PM and we can also setup appointments on Saturdays, Sundays and in the evening. Many throughout San Diego consider us to be the best trucking accident attorneys around. We wish you and your family the best and a quick and full recovery.